inXile Entertainment’s efforts to port the game over — and in particular to its handheld mode — should reward the company by giving it further fans appreciative of the convenience of being able to play it on the system. Interplay’s 1988 release Wasteland was the precursor to the Fallout series, but it wasn’t until Wasteland 2 was originally released for PC in 2014 that the Desert Rangers were given the opportunity to return. However, the return has been a strong one with Wasteland 2: Director’s Cut seeing the game also release for PlayStation 4 and Xbox One in 2015, and now making its way onto Nintendo Switch. Already with a strong reception on its previous releases, inXile Entertainment’s efforts to port the game over — and in particular to its handheld mode — should reward the company by giving it further fans appreciative of the convenience of being able to play it on the system. After putting nearly fifteen hours into it so far, I’ve found myself very much enjoying a game that I would likely never have played if it hadn’t come to the Switch. Wasteland 2 is set in 2102, fifteen years after the events of the first game, in an alternate history world created by a cataclysmic nuclear war between the US and Soviet Union. On the day the bombs dropped, a group of Army Engineers based in the southwestern United States ended up banding together and forming the Desert Rangers, a group devoted to help other survivors in the desert. However, in recent years the Rangers’ area of influence has been declining as its leadership attempts to protect the Rangers from raiders and other forces. The game begins with players creating their own rookie squad of four rangers. The individual recruits do not really play much of a role in the story itself, instead being more defined by their character attributes and those decisions taken by the player on behalf of the squad. Creating characters can be a bit overwhelming to those new to cRPGs, but the game has plenty of ready-built characters available to create a balanced party. 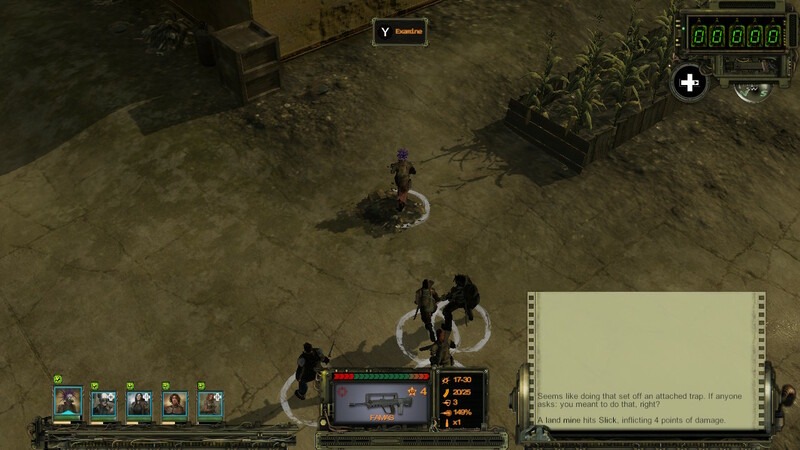 Wasteland 2 is all about assembling a squad of specialists; players will want to have their characters focusing on different skills as a character who is only semi-competent at a lot of things quickly becomes comparatively useless. There will be many times where players totally mean to set off a trap. Though the squad members never have much to say outside of asking questions or reporting their endeavours, the characters of the desert help to set the scene and give players enough reason to go about their primary mission of investigating the death of a Ranger at the hands of a “synth”, with the game’s first fifteen hours featuring plenty of strong writing. In addition to the four party members, players can enlist the assistance of up to three additional allies from the denizens of the wasteland, who, in addition to providing extra firepower, will have plenty of comments and conversations with NPCs, helping to bring life to the setting and missions. Choice and exploration is part of the game — particularly at the start where players can only save one of two possible locations — but so far Wasteland 2 has done a good job of keeping things focused, with most of its optional quests sticking close to the main task at hand and areas being decently constrained. It is possible to be a jerk through various quest choices or actions, but there have been plenty of warnings that doing so will result in problems for players, justifiably so considering their role as Rangers. There are a few difficulty options, though it cannot be changed during the game, which should cover both new and experienced players. Even on easy, players will need to keep on top of things and wisely upgrade their characters when they level-up to ensure that the party as a whole can adequately cover the range of skills. There’s a great feeling in being able to using the skills of different members to allow the group as a whole to get past the various roadblocks or dangers that the game can throw in the way. There can be some difficulty in determining where to go to complete missions, with many featuring rather vague instructions. 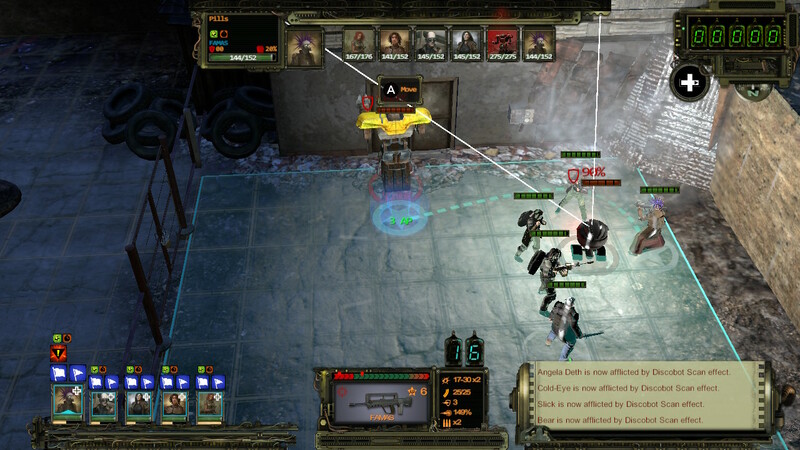 Wasteland 2‘s combat is turn-based on an individual character basis, which makes it a nice fit for console and handheld play. Location is a massive part of the combat as different weapons are effective within different ranges, combined with other elements such as cover. It strikes as a bit odd that a point-blank assault rifle shot is prone to missing, but the basic combat is easy to get the hang of and allows for neat tactical moments as players can use their squad together tactically. Each character receives a number of action points on his turn. Attacking will use a certain number of points depending on the weapon, while every square of movement also uses a point. Characters will also have to spend points reloading or using any skills, though switching between the two weapons each character has is free. There are plenty of tactical options available for players and the combat is certainly one of the game’s strong points. No name strikes greater fear into Rangers than “Discobot”. There are some long loading screens and some slowdowns, but otherwise Wasteland 2‘s Switch version runs effectively in both handheld and TV mode. The general level of graphics isn’t hugely impressive, but a good job has been done in ensuring that the UI is effective. The controls — after a small initial learning curve — are not difficult to get the hang of and allow a lot of flexibility in using the party, but it can be easy for players who are not careful will select options that they did not want to do. Parts of the wasteland can, by its very nature, come off as a bit dull, but there’s good variation in the locations, particularly in the Ag Center where a portion of the early game takes place. Voice acting is decent enough, but is only present for some scenes involving major characters rather than being universally present, while the sound effects in battle work nicely with good differentiation between misses and hits. I’ve generally struggled to get into cRPGs, but so far Wasteland 2 is following Divinity: Original Sin II as a great showcase for what they can do. The game works very nicely on the console and it’s a joy to have it available to just pick up and play in handheld mode. inXile Entertainment’s excellent translation of the game to the console has put it in a form that makes it much more appealing to both me personally and for many of those who might have been more hesitant to play it on other platforms.